Citation Information: J Clin Invest. 2012;122(8):2768-2770. https://doi.org/10.1172/JCI65208. In influenza virus infection, antibodies, memory CD8+ T cells, and CD4+ T cells have all been shown to mediate immune protection, but how they operate and interact with one another to mediate efficient immune responses against virus infection is not well understood. In this issue of the JCI, McKinstry et al. have identified unique functions of memory CD4+ T cells beyond providing “help” for B cell and CD8+ T cell responses during influenza virus infection. 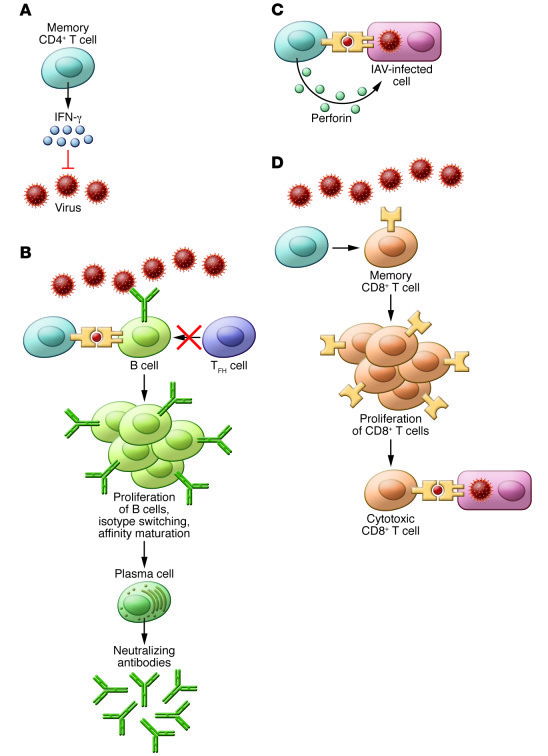 Memory T cell functions demonstrated during IAV infection. (A) Memory CD4+ T cells can clear low-dose influenza virus challenge independently of other lymphocytes by production of IFN-γ via a PRR-independent pathway. (B–D) Memory CD4+ T cells act through multiple pathways to mediate protection against high-dose influenza virus challenge. Memory CD4+ T cells enhance antibody production by B cells independently of TFH cells and germinal center formation (B), can select for influenza virus escape mutants through perforin-dependent cytotoxicity (C), and enhance CD8+ T cell responses (D).